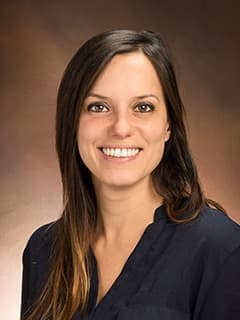 Manuela Lavorato, PhD, is a research associate with Mitochondrial Medicine and the Division of Human Genetics at Children’s Hospital of Philadelphia. Lavorato M, Iyer V R, Dewight W, Cupo R R, Debattisti V, Gomez L, De la Fuente S, Zhao Y-T, Valdivia H H, Hajnóczky G, Franzini-Armstrong C. Increased mitochondrial nanotunneling activity, induced by calcium imbalance, affects intermitochondrial matrix exchanges. Proc Natl Acad Sci U S A. 2017 Jan 31;114(5):E849-E858. doi: 10.1073/pnas.1617788113. Epub 2017 Jan 17. Perni S, Lavorato M, Beam KG. De novo reconstitution reveals the proteins required for skeletal muscle voltage-induced Ca2+ release. Proc Natl Acad Sci USA 114 (52), 13822-13827. Proc Natl Acad Sci U S A. 2017 Dec 26;114(52):13822-13827. doi: 10.1073/pnas.1716461115. Epub 2017 Dec 11. Lavorato M, Gupta P K, Hopkins P M, Franzini-Armstrong C.Skeletal muscle microalterations in patients carrying Malignant Hyperthermia-related mutations of the e-c coupling machinery. Eur J Transl Myol. 2016 Sep 15;26(4):6105. doi: 10.4081/ejtm.2016.6105. eCollection 2016 Sep 15. Linsley J W, Hsu I-U, Groomc L, Yarotskyy V, Lavorato M, Horstick E J , Linsley D, Wang W, Franzini-Armstrong C, Dirksen R T, Kuwada J Y, 2016. Congenital myopathy results from misregulation of a muscle Ca2+ channel by mutant Stac3. Proc Natl Acad Sci USA, 114(2): E228–E236. Lavorato M, Taiqin H, Iyer V R, Perni S, Meissner G, and Franzini-Armstrong C, 2015. Dyad content is reduced in cardiac myocytes of mice with impaired calmodulin regulation of RyR2. J Muscle Res Cell Motil. 36(2):205-14. Lavorato M, Bernabò I, Crescente A, Denoël M, Tripepi, Brunelli E, 2013. Endosulfan Effects on Rana dalmatina Tadpoles: Quantitative Developmental and Behavioural Analysis. Arch Environ Contam Toxicol. 2013 Feb;64(2):253-62. doi: 10.1007/s00244-012-9819-7. Epub 2012 Oct 13. Lavorato M. Mitochondria fission in fatigued muscle. Gordon Research Seminar and Gordon Conference, Muscle: Excitation-Contraction Coupling, 2017. Les Diablerets, Switzerland. Lavorato M, Iyer V. R, Franzini-Armstrong C. A convenient alternative view of muscle membranes. Gordon Conference, Muscle: Excitation-Contraction Coupling, 2017. Les Diablerets, Switzerland. Madan A, Viswanathan M C, Lavorato M, Schmidt W, Ochala J, Cammarato A, 2017. ACTA1-Related Nemaline Myopathy Mutations Engender a Range of Structural and Functional Phenotypes in Drosophila Indirect Flight Muscles. Biophys J, 112 (3) p182a. Iyer V R, Monfredi O, Maltsev V, Lavorato M; Stern M, Franzini-Armstrong C, 2016. SR Contribution to Calcium Cycling in Sino-Atrial Node Cells: As seen from Nanoscale Electron Microscopy and Numerical Modeling. Biophys J 110, 359a. Lavorato M, Ramesh V I, Zhao Y-T, Valdivia H H, Franzini-Armstrong C, 2016. Electron tomography of mitochondrial nanotunnels in a CPVT model with RyR2 loss-of-function mutation. Biophys J 110, 367a. Lavorato M, Schmidt W, Viswanathan M C, Ochala J, Franzini-Armstrong C, Cammarato A, 2015. The actin F352S nemaline myopathy mutation disrupts indirect flight muscle structure and function in Drosophila. Biophys J 110, 128a. Iyer V R, Lavorato M, Zhao Y-T, Valdivia H H, Franzini-Armstrong C, 2015. Mitochondrial abnormalities in a mouse CPVT model with RyR2 loss-of-function mutation. Biophys J 108, 132a. Beqollari D, Romberg CF, Feng W, Lopez JR, Lavorato M, Perni S, Hopkins PM, Franzini-Armstrong C, Pessah IN, Allen PD, Beam KG, Bannister RA, 2015. Calcium channel dysfunction in a mutant mouse model of malignant hyperthermia (CaV1.1 R174W). Biophys J 108, 504a. Iyer V R*, Lavorato M*, Zhao YT, Valdivia H., Franzini-Armstrong C. Ultrastructural cardiac alterations resulting from cardiac RyR2 mutations with opposite functions. * contributed equally. Gordon Conference: Muscle: Excitation-Contraction Coupling, 2015, Sunday River in Newry ME United States. Lavorato M. Gordon Research Conference and Gordon Research Seminar. Muscle: Excitation -Contraction Coupling. Les Diablerets, Switzerland. Selected talk, two posters’ presenter. Lavorato M. 60th Biophysical Society Annual Meeting. Selected talk and poster presenter. Lavorato M. Biomedical Postdoctoral research symposium, University of Pennsylvania, Philadelphia, PA. Poster presenter. Lavorato M. Gordon Conference: Muscle: Excitation-Contraction Coupling, 2015, Sunday River in Newry ME United States. Selected talk and poster presenter. Lavorato M. 59th Biophysical Society Annual Meeting, Baltimore, Maryland (poster presenter). Lavorato M. Biomedical Postdoctoral research symposium. Perelman School of Medicine, University of Pennsylvania, Philadelphia, PA. Poster presenter. Lavorato M. Mitochondrial nanotunnels in a CPVT model with RyR2 loss-of-function mutation. The ISHR-Latin American Section-Sponsored Symposia during the XXIV Congreso Argentino de Hipertensión, Mendoza, Argentina.